PHP Scripts Mall has developed the user recommend Entrepreneur CRM Script to ensure the development and maintenance of the company organizations, this script is designed for the companies who are challenging day to day thousands of the marketing inquiry, tickets and proposals where this lead to the mislead statistics report of the system. To overcome this circumstance we have developed this advanced CRM system, where we have designed with collaborations of the managing resources tools and features in single dashboard. This helps the organization to make the clear statistics report of the managing resources. In this Readymade Entrepreneur CRM PHP Script we have developed the system with mutual benefits like the specific project goals, payroll and inventory management, project status, invoice generation, payments, project deadlines, sales report, and other essential management features. We have integrated the email compose and inbox management for the organization or user to send and receive the emails through our CRM script. This Online Entrepreneur CRM Script is much essential for business organizations, project managing industries and market shopkeepers to have their own efficient CRM software for their business and project requirement. The Entrepreneur CRM Solution is designed with the advanced integrated fully-featured dashboard for managing. Our team experts have analyzed and developed the script with strategies and technology to analyze, manage the customer interactions and to improve the goals of the projects by analyzing the tickets, proposals, and quotations etc. We have developed the script based on the user or organization project business management. 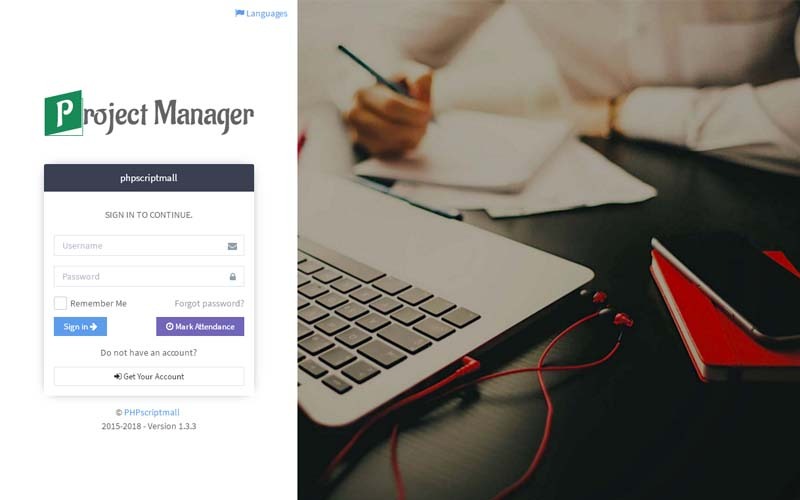 Here the site manager can register their account with the valid mail id and password to avoid unauthorized person to enter into the system. In this Entrepreneur CRM Script, the user can have the clear home dashboard of the recently paid invoices, payments, recent projects, recent activities, emails, and announcements. We have also integrated six types of payment gateways to make the transactions and payments methods simpler and convenient. Also, our advanced payroll method will help the managing owners to make their process details fast and reliable. This script is flexible and user-friendly for the business entrepreneurs and project organizations to manage the entire CRM process without any guidelines or steps. Overall it is one of the best inventory managing scripts. The Readymade Entrepreneur CRM PHP Script can also import the CSV files to the system for the deposit, expense, tax, project, leads and clients. Our knowledge base function will help you to get your results. We have also included the advanced search box filter to get the result. The ticket management will help you to answer the tickets with efficient managing system, the manager can search for the ticket by entering the ticket code in the search box to get accurate results. We have also included multiple language translation management for the user benefits. We are sure that this Project Management PHP Script has the complete package of the advance CRM, Inventory and Project management with user-friendly customization. We have 450 plus scripts with user preferable customization, SEO-friendly URL, fully secure code, and brand-free site. In additionally, we also offer 6 months free update services, 1-year technical support and 24×7 technical support team help for your solution. The Entrepreneur CRM Solution is designed with the advanced integrated fully-featured dashboard for managing. Our team experts have analyzed and developed the script with strategies and technology to analyze, manage the customer interactions and to improve the goals of the projects by analyzing the tickets, proposals, and quotations etc.